After adopting a baby, you’ll most likely be focused on caring for your new miracle to the best of your abilities. After awhile, though, you may yearn to communicate with your child’s biological parents. One desire that has been known to cause complications is the process of communicating with the biological family during the holiday season. While the adoption process of the past relied on secrecy to keep both biological and adoptive families separate, today’s climate places a high emphasis on the value of open adoption. Parents on both sides can (when allowed) communicate with one another in a mutually designed fashion, allowing everyone to be open and talk about the progress of the child. A is 4 Adoption is here to help you through every step of the adoption process, working tirelessly to reduce the stress while shortening the wait time as much as possible. We are not a California adoption agency; our adoption center focuses on comprehensive birth mother help to encourage a happy and healthy outcome for all parties. The holiday season represents the perfect time to reach out and supply your adopted child’s family with cheer. While done with the best intentions, this endeavor has been known to complicate matters. Today, we’ll take a look into a few suggestions that may prove helpful in exchanging gifts with your child’s biological or adoptive parents. If you are interested in learning more about our optimal adoption process, be sure to contact us today! The phrase “It is always easier to ask forgiveness than it is to get permission” is not accurate in this case. Domestic infant adoption often entails a positive relationship between both families, relying on the mutual goal of creating the best possible outcome for the child. If you have adopted a child, it’s important to remember that the birth parents may be dealing with a much different holiday season than you are. Sending a gift without warning to this family may create an awkward situation, where one party now feels obligated to match the expense of the item sent to them out of the blue. A price limit. One of the best details to discuss is the intended cost of your gifts. Purchasing a present that is too costly can make things awkward between birth and adoptive families. The number of presents can also be discussed. The gift type. Everyone is different, and your child may have a far different want than other individuals his or her age. While this isn’t quite as challenging for infants, finding a meaningful gift for a toddler can be very hit or miss. Correct sizes. Children grow at different rates, making it difficult to determine an accurate sizing for your little one. Planning your shopping spree in advance with the other family will help to avoid any comical or costly sizing mistakes. Being inclusive for both families can prove to be very helpful in avoiding any feelings of isolation. 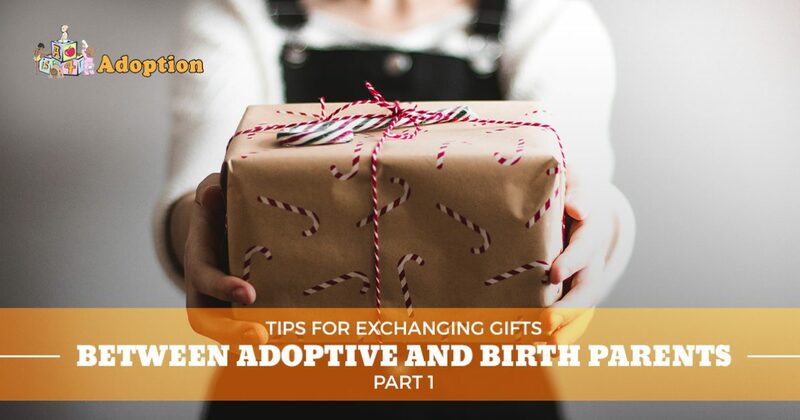 Whether you’re sending a gift to the adoptive family or to the biological family, it is often worthwhile to include other children in the exchange. Children are often very cognisant of what is or is not fair during the holiday season, and being able to determine whether or not things were done fairly. The small act of sending a gift to one sibling but not the other can cause conflict in the home. A is 4 Adoption recommends expanding your holiday gift exchange to involve the children from both families. This process will help to make everyone happy while also promoting a better relationship between you and the other family. Every child will feel included in this complex situation, because what kid doesn’t love presents? Even items that are less than 15 dollars can make a big difference during the holidays! The holiday season can create logistical challenges when it comes to exchanging gifts between biological and adoptive families. When done correctly, though, this endeavor can prove to be very beneficial for everyone involved. Next time, we’ll continue on this topic by discussing a few more tips to help you in giving gifts through the holidays. A is 4 Adoption is here to serve as your liaison throughout the adoption process, striving to provide guidance and support every step of the way to produce an amazing outcome. Unlike any adoption agency in California, our center strives to deliver comprehensive support services to both the birth mother and the adoptive parents. We understand that there is a lot of red tape in the adoption industry, and our experienced representatives work hard to simplify each stage as much as possible for you. Contact us today to learn more about our program!